An Awkward Silence - St. Who? How is it that a founding father was forgotten? When Herbert de Losinga built his new cathedral church in Norwich, he wanted to stress the continuity with the church that had been. Yes, he was a Johnie-come-lately Norman, but he was a genuine successor of the founding father. 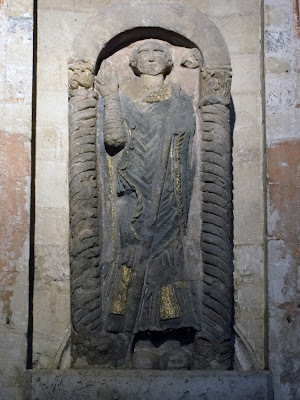 So he placed an deliberately antiqued image of the first Bishop of East Anglia - St.Felix - above the bishop's entrance in the deliberately antiqued north transept! http://www.racns.co.uk/sculptures.asp?action=getsurvey&id=1109. It is a door still used by the Bishop of Norwich. My servant Google searched high and low to see if he could find reference to the saint within the Diocese of Norwich. Save for an obscure mention in Norwich Cathedral's latest music scheme, to say 8th March is the feast Day of St.Felix, nothing! nada! zilch! Why would a diocese not celebrate the feast day of a founding saint?